↑ Herrmann, Wolfgang (2011). Vitamins in the prevention of human diseases. Berlin: Walter de Gruyter. p. 245. ISBN 9783110214482. ↑ 4.0 4.1 4.2 4.3 Hunt, A; Harrington, D; Robinson, S (2014-09-04). "Vitamin B12 deficiency". BMJ (Clinical research ed.). 349: g5226. doi:10.1136/bmj.g5226. PMID 25189324. ↑ 5.0 5.1 5.2 5.3 5.4 5.5 "Dietary Supplement Fact Sheet: Vitamin B12 — Health Professional Fact Sheet". National Institutes of Health: Office of Dietary Supplements. 2016-02-11. สืบค้นเมื่อ 2016-07-15. ↑ Lachner, C; Steinle, NI; Regenold, WT (2012). "The neuropsychiatry of vitamin B12 deficiency in elderly patients". The Journal of neuropsychiatry and clinical neurosciences. 24 (1): 5–15. doi:10.1176/appi.neuropsych.11020052. PMID 22450609. ↑ 7.0 7.1 Vidal-Alaball, J; Butler, CC; Cannings-John, R; Goringe, A; Hood, K; McCaddon, A; McDowell, I; Papaioannou, A (2005-07-20). "Oral vitamin B12 versus intramuscular vitamin B12 for vitamin B12 deficiency". The Cochrane database of systematic reviews (3): CD004655. doi:10.1002/14651858.CD004655.pub2. PMID 16034940. ↑ Schwartz, William (2012). The 5-minute pediatric consult (6th ed.). Philadelphia: Wolters Kluwer Health/Lippincott Williams & Wilkins. p. 535. ISBN 9781451116564. ↑ Reynolds, E.H. (2014). "The neurology of folic acid deficiency". Handb Clin Neurol. 120: 927–43. doi:10.1016/B978-0-7020-4087-0.00061-9. PMID 24365361. ↑ "Pernicious anemia: MedlinePlus Medical Encyclopedia". National Institutes of Health: National Library of Medicine. สืบค้นเมื่อ 2013-12-29. ↑ 30.0 30.1 30.2 McBride, Judy (2000-08-02). "B12 Deficiency May Be More Widespread Than Thought". Agricultural Research Service. United States Department of Agriculture. สืบค้นเมื่อ 2012-07-02. ↑ Baik, H.W. ; Russell, R.M. (1999). "Vitamin B12 deficiency in the elderly". Annu Rev Nutr. 19: 357–377. doi:10.1146/annurev.nutr.19.1.357. PMID 10448529. ↑ "Vitamin B12 / Pathophysiology Text". LifeSave.org. p. 215. สืบค้นเมื่อ 2013-12-31. ↑ Solomon, LR (2015). 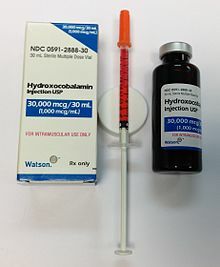 "Cobalamin-responsive disorders in the ambulatory care setting: unreliability of cobalamin, methylmalonic acid, and homocysteine testing". Blood. 105 (3): 978–85. doi:10.1182/blood-2004-04-1641. PMID 15466926. ↑ "Test used to diagnose B12 deficiency may be inadequate". news-medical.net. 2004-10-28. สืบค้นเมื่อ 2007-12-04. ↑ "Sluggish? Confused? Vitamin B12 May Be Low". Wall Street Journal. 2011-01-18. ↑ Butler, C. C.; Vidal-Alaball, J; Cannings-John, R; McCaddon, A; Hood, K; Papaioannou, A; McDowell, I; Goringe, A (2006). "Oral vitamin B12 versus intramuscular vitamin B12 for vitamin B12 deficiency: A systematic review of randomized controlled trials". Family Practice. 23 (3): 279–285. doi:10.1093/fampra/cml008. PMID 16585128. ↑ Thomas, Donald (2011-06-22). New Jump Swing Healthy Aging and Athletic Nutrition Program. Xlibris. p. 41. ISBN 978-1-4628-8427-8. Pacholok, Sally M.; Stuart, Jeffrey J. (2011). Could It Be B12? : An Epidemic of Misdiagnoses. Fresno, CA: Linden Publishing. ISBN 978-1-61035-065-5. Hooper, M. (2012). Pernicious Anaemia: The Forgotten Disease - the causes and consequences of Vitamin B12 Deficiency. London: Hammersmith Press. ISBN 978-1-78161-004-6. หน้านี้แก้ไขล่าสุดเมื่อวันที่ 19 ธันวาคม 2559 เวลา 13:56 น.